Bosch GSA 1300 PCE Sabre Saw & Blade Set 1300 Watt 110 Volt Version. The Bosch GSA 1300 PCE Sabre Saw has the lowest vibration in its class, allowing for low fatigue working thanks to its anti-vibration handle and mass balance. The high-performance motor is fitted with Constant Electronic for the toughest applications and a constant pendulum stroke for fast sawing progress. Uses an SDS saw blade changing system for fast and convenient blade changes, with one hand. Other features include a constant LED light for illuminating dark work areas, tool-free adjustable saw stop, metal hanging hook and a rubber-coated gear housing for a secure and comfortable grip. Comes with a metal saw blade S 123 XF, wood saw blade S 2345 X and a carry case. 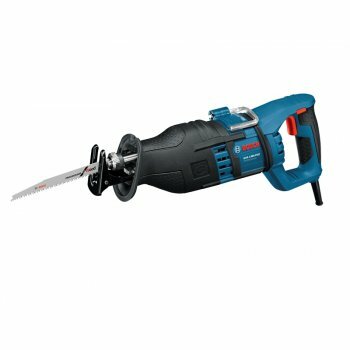 Specification Input Power: 1,300 Watt.No Load Speed: 0-2,900/min.Stroke Length: 28mm.Cutting Depth: Wood: 230mm, Metal Profiles and Pipes: 20mm.Weight: 4.1kg.